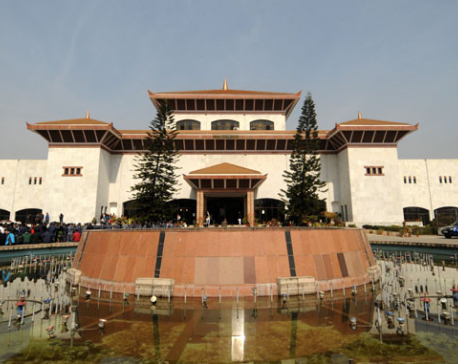 KATHMANDU, Dec 10: A parliamentary committee has directed the government to punish the heads of development projects that fail to adequately spend their budgets. Addressing a Development Committee meeting in Kathmandu on Thursday, its chairman Rabindra Adhikari also directed the government to increase development expenditure to 90 percent in the current fiscal year. Adhikari later told Republica the meeting had decided to instruct the concerned bodies not to allocate budgets to projects that had been allocated budgets without preparation. The committee also directed related ministries and institutions -- including the National Planning Commission, the Ministry of Finance, the Ministry of Physical Infrastructure and Transport, and the Ministry of Federal Affairs and Local Development -- to take action against the heads of the development projects, he said. As of Wednesday -- almost five months into the current fiscal year, the government had spent only 6.55 percent of its capital budget. This was not an encouraging sign for the economic development, the committee concluded. construction citing various reasons, and a failure to blacklist contractors who fail to complete projects on time were discussed by the committee. Lawmakers at Thursday’s meeting said the government needed to increase its absorptive capacity to increase budget-spending. Low development spending results in low economic growth, something the country has been going through in the last decade, they said. Other factors hitting development expenditure were lack of human resources at local bodies utilizing the development expenditure, lack of coordination among the different concerned bodies, and the transfer of employees at the wrong time, the lawmakers said. Meanwhile, a Ministry of Finance official told the committee that it had been preparing to redirect the budget away from projects which had not shown satisfactory performance to projects that were performing better. Finance Secretary Shanta Raj Subedi told the meeting that the ministry had issued a 10-point directive on November 23 to the bodies concerned with spending the development budget. Can We Believe and Hope for A Better Tomorrow?